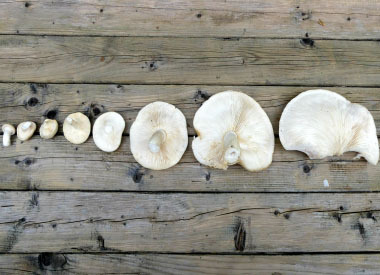 Overview: This easy-to-spot mushroom is often mistaken for the common oyster until there is closer examination (common oyster gills are decurrent, elm oysters are not decurrent). 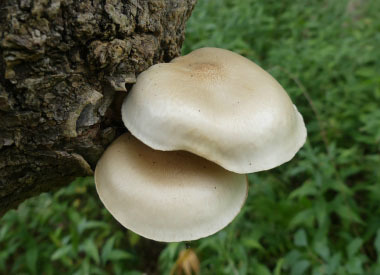 It's Latin name Hypsi means "high" or "on high" and zygus means a "yoke" Hypsizygus, then, referring to position of this mushroom often high in the tree. 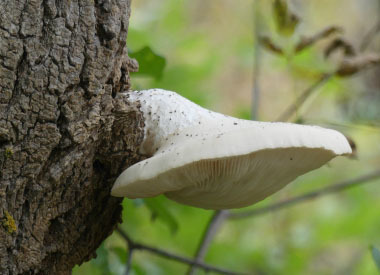 Ulm refers to "elm" indicating one of the common substrates for this fungus. 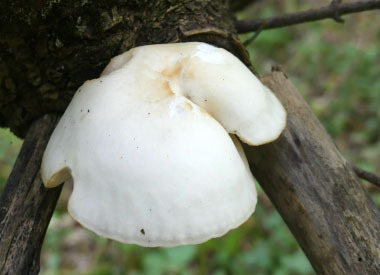 Distinguishing Features: The colour of the fruiting bodies often depends on its substrate and habitat. Caps can measure anywhere from 5 to 15 cm wide. They are white to buff or tan in colour and sometimes developing a pattern of cracks with age. The stipe is white to off white; dry; smooth; stout; and it develops off-centre to nearly central from the cap. They are often mistaken for being the common oyster. Height: The stipes reach anywhere from 5 to 10 cm long and can be 1 to 3 cm thick. Although the stipe can be 10 cm long, its actual height may not reflect that depending on how to grows. 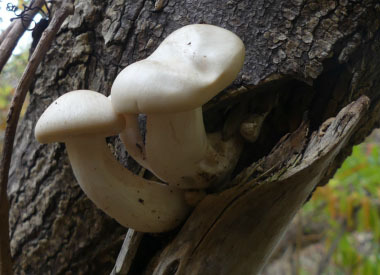 Habitat: The elm oyster is distributed all over the temperate climate zones in deciduous and mixed woodland where it grows mainly on boxelder maples or elms. 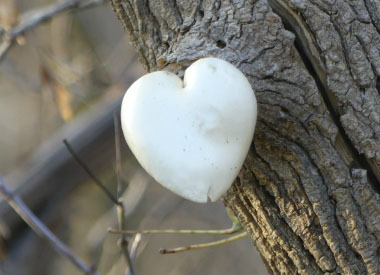 It has been reported that they are found on beech and oak trees as well. 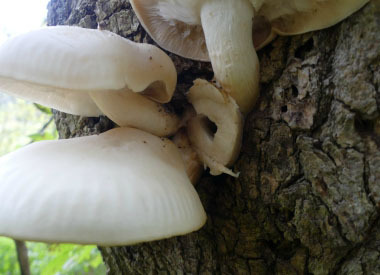 Elm oysters are ubiquitous on wounds of living box elders. 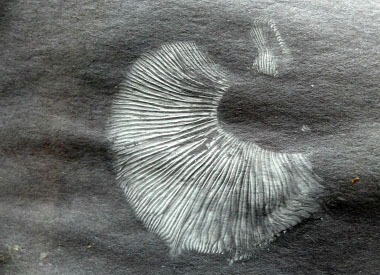 Spore print: White to somewhat buff. Season: August to December depending on geographical location. 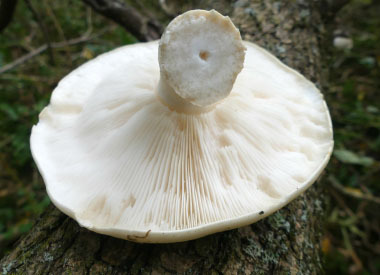 Gills: Attached but not decurrent; whitish, becoming cream with age. 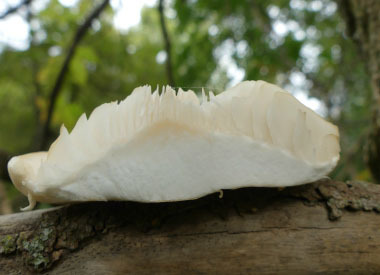 Edibility: The elm oyster mushroom is an excellent edible mushroom which is also grown for commercial purposes. It is an excellent source of protein and vitamins (especially the B-complex). They must be cooked before consuming.